The short piece here is an update on the latest ideas of capitalist policy-makers to solve the intractable economic crisis (“slowdown in the world economy”) by means of “non-conventional monetary policies”. 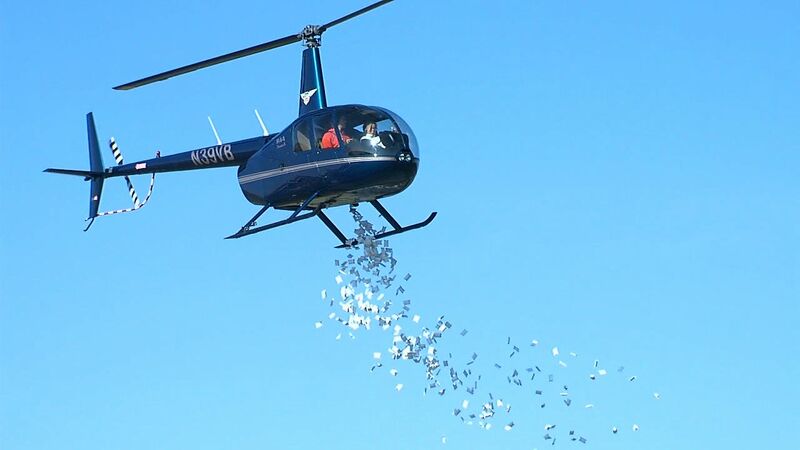 These range from the ECB’s extension of “Quantitative Easing” to include bonds issued by private companies to the growing calls for demand to be stimulated by means of the “helicopter drop” where everyone is handed a sum of cash to spend. For the capitalists any means of increasing returns (since all profit for them is, in the end, financial in form) is welcome but some are intuitively realising that without growth in the ‘real economy’ – i.e. without an increase in the rate of production of new value, then the constant attribution of higher financial values on the basis of electronic transactions is only exacerbating the crisis of profitability. By the same token, inflation would not only give the appearance of a more dynamic economy, the capitalists assume it would help them reduce the real value of their debts as the nominal currency values remained the same. “Absence of growth” is put down to the mistaken “policies” of central banks and by governments’ lack of will to “stimulate” demand. Everyone is calling for more investment in new public works (even the various mafia cliques are lining up with the OECD and IMF to stress how urgent this is). What’s more, if the “shortage of demand” persists, how are we going to sell goods? We need an expansive fiscal policy – so say both the left and the right – with rock bottom interest rates and “monetarisation of spending” (i.e. more spending). In short, a state fiscal and interventionist policy aimed at creating a good climate for business. No matter if the state deficit jumps. So now the mass media are focussing on the discovery of the century which was re-introduced to the public debate some time ago by Jeremy Corbyn: “quantitative easing for the people”. Both The _Economist_ and the Financial Times are in favour of this. It was Milton Friedman (boss of the Chicago boys, consultant of Pinochet) who originally came up with the idea of dropping “helicopter money” directly on ‘citizens’. Even some esteemed professors of Oxford University have invited the ECB to channel money towards workers and pensioners (those provided with a tax code and enrolled on the electoral register …). A little bit of credit from heaven! Anyone who wants a real "loan" (500 or 1000 euros) at almost zero rate, must be given it right away, always in the hope that inflation increases along with the cost of living for workers and retirees! What they wouldn’t do for "European needs" (and corporate bonds issued by companies)! And in fact it must be said – as the ECB’s Quantitative Easing sinks into the swamp of the financial world – that there clearly is rising inflation in the estimated value of financial assets which are ballooning and whose next explosions will shatter more than a few gleaming windows. Bubbles are being fuelled precisely by the continual printing of money; speculative bubbles that are about to land … with a loud burst. The danger is such that the "watchful" ECB has extended its purchases so that in addition to state debt (bonds), it is also buying bonds from the commercial and business world: bonds rated "investment grade", judged risky but acceptably so ... So the accumulation of debt on debt continues. There is not a good hedge fund manager in the world who does not applaud. After all, even the banks have to survive (even when they are nationalised …); if they do not have their earnings, including lending and deposit rates, how can they strengthen their assets? They still need "room for manoeuvre", once asset prices are under "democratic" control and short-term capital movements are regulated (!?). And while they vainly search for the solution to the dilemma, alarm signals are going up about the risk to “earnings” from life insurance policies and pension funds. As for negative money rates (someone has suggested this) it is clear, from experience, that much of the money created would remain locked in the form of waste paper. * It already is. Moreover, there would finally be a bit of inflation and this – as all of them are praying – would be a blessing, along with "heavy investments", ecological diversification of economies, restructuring and industrial redevelopment, etc. Meanwhile, The Economist, no longer knowing what to advise its readers in the face of the growing "malaise" of the economy (the British, it seems are running out of ideas), does not even rule out some kind of stimulus in favour of wage increases, especially as there are not going to be so many workers with a job and a wage! Waste paper in the form of ‘non-performing’ loans on banks’ balance sheets or additions to the mounting pile of sovereign debt as these loans are transferred from the private to the state sector.